How comedy has helped us process the tragedy. The story of comedy’s relationship with 9/11 begins with the departure of comedy, at least for a few weeks. Even comedic venues, like clubs and radio waves and late-night desks, became somber platforms for people to clench their fists, cover their mouths or cry. From the very beginning, 9/11 was not funny. It still isn’t, but humor has been born out of it, and that’s good, and that’s vital. In the days following the attacks, staples of comedy like The Late Show With David Letterman and Jon Stewart’s The Daily Show were off the air. Letterman came back Sept. 17. Conan O’Brien came back the 18th. Jon Stewart, tearfully, on the 20th. Each institution’s return was somber and subdued and direct about what happened in New York. There wasn’t a return to normalcy, because normalcy had been upended. Normal was different now, and while the country was struggling to adapt to a world of uncertainty and evil and vulnerability, there wasn’t room for jokes. Humor is for the most part rooted in truth, so when the world is rocked by unknowns, humor becomes elusive. For a time, it was. Some comedians tried to attack the nation’s fear in their act—Gilbert Gottfried infamously joked at a roast just weeks later that his upcoming flight to California “had to make a stop at the Empire State Building first,” to which he received the first notable usage of the “too soon” critique—but it wasn’t the time. No one knew how to think about 9/11 jokes yet because no one knew how to think about 9/11 itself, yet. How were you supposed to laugh at it? The crowd roared. If you couldn’t be funny about 9/11 still, the mayor’s joke was affirmation that you could be funny around it. You could be funny in the context of it. Within a historical moment when we still turned to political leaders for the guidelines of how to handle a tragedy, it was essential for Americans to see Giuliani tell a joke, before a crowd of the city’s firefighters and policemen, no less. It gave the nation permission to breathe outward. If the mayor could find a reason to crack a smile, maybe we could, too. Memeification has a juvenile connotation, but at its best, the viral jokes against 9/11 conspirators carried a high level of sophistication, one that crucially reaffirmed to everyday Americans that, don’t worry, these guys are just as crazy as you think they are. In a time marked by paranoia and confusion, the extremes naturally gave birth to conspiracy theories related to the attacks, so for the internet to target the crazies not only served to undermine damaging falsehoods, but also ease the minds of people who still had no idea what to think. Bush did 9/11? Whatever you say, pal. Of course, on the opposite side of the tinfoil hat people were those who capitalized on the solemnity of the moment for personal gain. The “never forget” tagline was only overused in that it was misused, by advertisers and used-car salesmen and hucksters nationwide. Here are some great savings on 9/11 weekend to honor the troops, or the first responders or those we lost. Remember them with a new mattress or dining room set or Hyundai Sonata. It was gross. Thank goodness we had places like The Onion to call them out. The Onion has long been one of the bravest comedic responders to 9/11, and its effectiveness is uniquely impressive for how it manifests from a multitude of angles. Faux-sincerity around memorializing the World Trade Center was perhaps inevitable, but when The Onion does something like Subtember 11, it neutralizes the panderers and, in a way, highlights capital injustice. When people feel a lack of security, they can take desperate measures to find it again. Publishing something absurdist and obvious reveals the less obvious ways people were taken advantage of after 9/11. This is satire as service, case in point. As we grow further from 9/11, our feelings about it and reactions to it have evolved. These days we consider more how the event shaped our nation’s xenophobia, as well as the things we value in regards to security and intelligence. Our confusion over what happened has given way to a general confusion over how to make sure this never happens again. What should the government know about us, if it should know anything? What should our military operatives do to obtain knowledge of the enemy, especially knowing now how much we don’t know. Who is the enemy? How do we go about figuring that out? Should our default be to trust everyone, or trust no one? Some things have crystalized. More things persist in mystery. So, then, does the comedy around 9/11 become more nebulous and sophisticated. Now it deals as much with the international conflicts that have emerged in the past decade as it does with the attacks themselves. 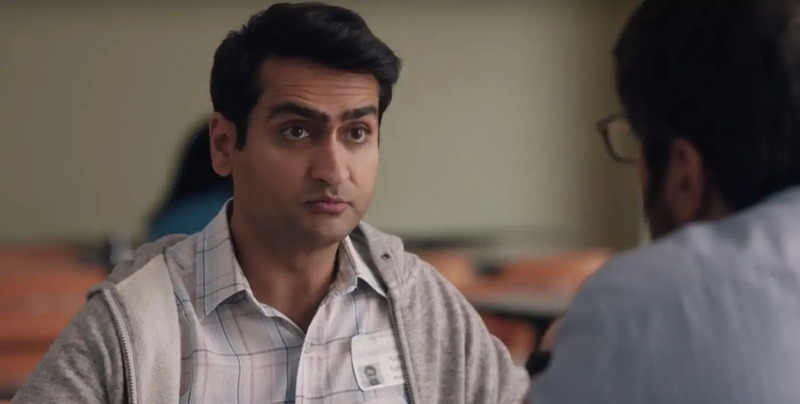 There are few better examples of this than Kumail Nanjiani’s 9/11 joke in The Big Sick. Nanjiani’s character, a Pakistani-American (as Nanjiani is in real life), can see all the bullets in this loaded question, but he knows Romano means well, so he cracks a joke in an effort to bring the tension to the forefront. Of course, it backfires, but that reaction in itself is even more evident of that long-held American value: You don’t joke about 9/11. And yet, this scene is still funny, and uncontroversially funny, for the truth it finds in the way different people can struggle to dialogue about something important when their ways into the topic are fundamentally different. Humor, both in the moment and as a concept, is a mode of processing in America. That’s why so many comedians now take their personal lives onstage with them, and it’s why we’re seeing such an increased proliferation in the Daily Show-style talk shows positioned to take apart the news and mine it for laughs. September 11 wrote the rulebook for how comedy can be that processing system, and it remains the scale for how we measure the appropriateness of tragedy-related humor. What 9/11 humor did more, however, than set that precedent was offer an immediate salve to a national restlessness. It soothed us by giving us that sense of steadiness in a period marked by constant revelation. In other ways, it critiqued us, mocking the ways some sought to capitalize on the attacks and eradicating others who spread lies about what happened. Comedy, in that sense, was our protector. Now, it’s predominantly our mirror. The only thing that remains true for most about 9/11 is the perpetual state of uncertainty it left us in, whether that’s related to what actually happened at Ground Zero or the way we’re supposed to treat other nations or the way we’re supposed to treat other people. Comedy after 9/11 exposed our suspicions and our biases, our heroism and our resilience, our fears and our flaws. It didn’t appear when it wasn’t needed and it never compromised when it was. It gave us power to laugh again. That’s a special freedom.